Friday August 4, 2017: Paul and Brady get an important lead, Gabi overhears Chad talking to Abby, and Patch figures something out. Andre and Gabi talk in the park. She can’t believe that Chad killed Deimos. He explains that Chad doesn’t remember doing it. There’s a photo of him with the body but Abby destroyed it. Andre wants her to help him protect Chad. She’s astounded that Abby would have left behind everyone she cared about for Chad. Distraught, she rushes off. Brady returns to the Kiriakis mansion and asks Nicole where she went. She claims she was out for a walk. Brady flashes back to seeing her coming out of Eric’s room. Paul calls and asks to meet so Brady takes off. Meanwhile, Victor makes a call, ordering someone to get Sonny out of jail and get someone else to take the fall. Nicole interrupts and Victor complains about how she will revert to type and betray Brady. He wishes he’d stopped her from working through the men in his family ‘like a virus’. She accuses him of still being a mobster and reminds him that she took a bullet for him. Victor admits he’s on edge because of Sonny. Nicole tells him Paul seems to have a lead. At home, Joey refuses to believe that Tripp would set his mom up. Patch is sure. Joey remembers Tripp saying Kayla’s not a saint. They guess that he must think Kay killed Ava. Eventually, Joey recalls that Tripp talked to Jade and calls to leave her a message. Patch walks out to find Tripp, hoping he’s not dangerous. Chad is by Abby’s side in the hospital. He talks about his insecurities and the mistakes he’s made. The DiMera tries to figure out what she was thinking and if she thinks he killed Deimos. He pieces together what she was doing with Dario and is sorry for how harsh he was to her. A doctor comes in to examine her and Chad refuses to leave her side. Meanwhile, Eric is with Jenn in the waiting room. She’s frustrated so he takes her to the chapel to pray. After that, they run into Patch by the elevators as he looks for Kayla. He takes off as Gabi walks in. 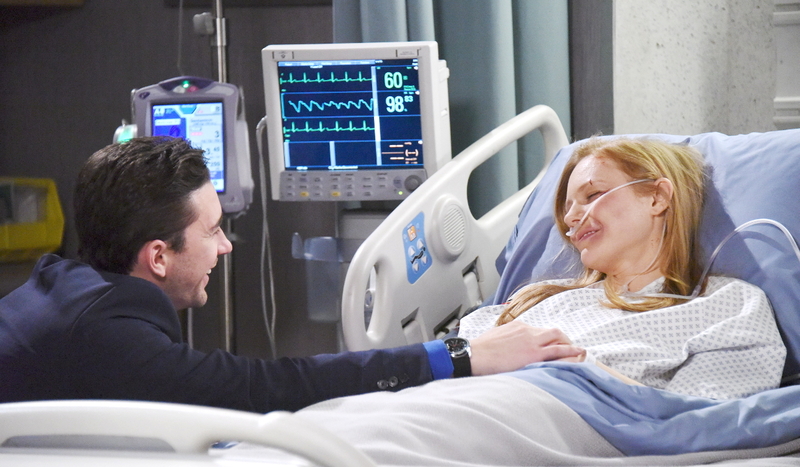 She asks a doctor for an update on Abby. He tells her how devoted Abby’s husband seems to be. Back down the hall, Chad tells Abby they should have been a family again. Gabi listens in the doorway as he apologizes to Abby for running away on her. He’s always wanted her, needs her and loves her. Gabi heads down to the chapel. She cries and prays for forgiveness for being selfish. Back in Abby’s room, she finally opens her eyes. Tripp stands over Kayla with a pillow in the on-call room. She wakes up and is startled to see him. “I know what you did,” he says. As he rants, she guesses he set her up. He admits it and accuses her of killing his mom. She denies it but he doesn’t believe it. The doctor tries to talk him down so they can get beyond this. That fails. He gets more irritated and accuses her of taking everything from him. It’s time she pays for it. Tripp pulls a scalpel on her. He prompts her to confess so he can record it. When Patch walks in, Tripp grabs her and threatens to kill her. Brady meets with Paul in the square. Paul thinks that Xander killed Deimos and Victor hired him to do it. Brady doesn’t buy it. They try to figure out who was going back and forth on the Titan jet from Greece. When the pilot shows up, Brady demands some answers. 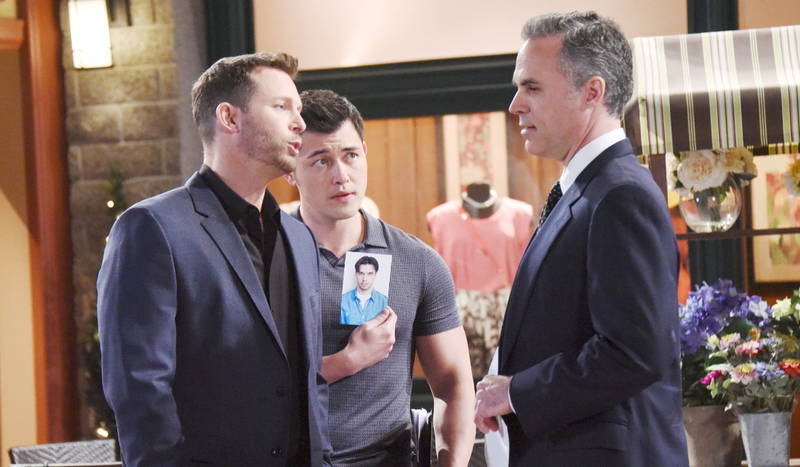 The pilot admits that Victor authorized the flights and identifies a photo of Xander. After he leaves, Brady and Paul try to figure out what Victor has done. Paul expects that Brady can get a confession out of him. Joey puts himself in danger for Kayla. Gabi makes a hard choice.